Do You Have These Amazing Maria Sharapova Cards? Maria Sharapova is one of the most popular female athletes on the planet. Her personality and attractive looks may help her get endorsement deals and into the pages of gossip magazines, but the same could be said about Anna Kournikova a decade ago. It's her on-court play that has made her a champion and make Maria Sharapova cards worth collecting. Click here to see our Maria Sharapova rookie card checklist and buying guide. With her 2012 French Open victory, Sharapova entered into tennis' elite having completed a Career Grand Slam. She is just the tenth woman to claim victories at the US Open, Australian Open, French Open and Wimbledon. Here are five Maria Sharapova cards worth looking for. Although not a traditional trading card in the sense that it was inserted in a pack, the 2004 Sports Illustrated for Kids Maria Sharapova was a part of a sheet inserted in the magazine. The card comes with perforated edges so that it could be separated from the rest of the sheet. As a result, many you find come with very rough sides. One of only two Maria Sharapova rookie cards, her 2005 Ace Authentic Debut Edition card has a simple design. However, the gratitude and joy in the tennis star's smile are what make it stand out more than Sharapova's cluttered 2005 Ace Authentic Signature Series rookie. Early signatures and event-worn swatches from two of modern tennis' biggest stars help ease the pain of the horrid stickers Ace Authentic used for this card. Limited to 50 numbered copies, expect to pay big for this dual-sided card. Ace Authentic isn't known for their on-card signatures. 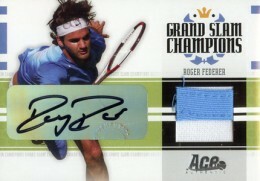 As a result, collectors need to look outside of the tennis courts for a hard-signed card. A short print, her 2006 Stellar Sports Illustrated Swimsuit Issue Autograph doesn't pop up that often. However, it is one of the top Maria Sharapova cards thanks to something as simple as a signature. Maria Sharapova has lots of memorabilia cards. However, her 2009 Stellar Sports Illustrated Swimsuit Issue Memorabilia card offers something a little different. It comes with a bikini swatch worn during a shoot for the popular magazine. The card's unique nature makes it so much more interesting than most of the other common Maria Sharapova cards out there that come with a swatch. SHARAPOVA is gorgeous. She has a gorgreous face and body. ANNA KOURNIKOVA IS NOT. SHE LOOKS LIKE A HORSE FACE! Never had talent except for one thing. Guys you know what i mean. stick job!